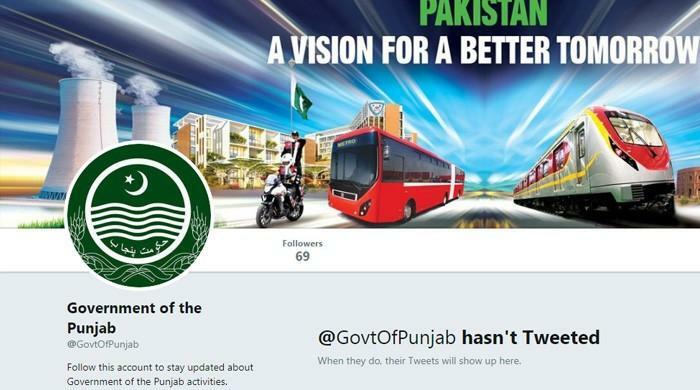 According to an earlier news published in daily The News it was revealed that official verified Twitter account of Govt of Punjab (@GovtOfPunjab) has been deleted. That story compared old and new accounts having same handle but different number of followers. It seems as if those 225K+ followers have just vanished into thin air along with all the data and verification seal. All the while social media was abuzz on PML-N’s reluctance over transferring access of the same account to the newly elected Pakistan Tehreek-e-Insaf government. 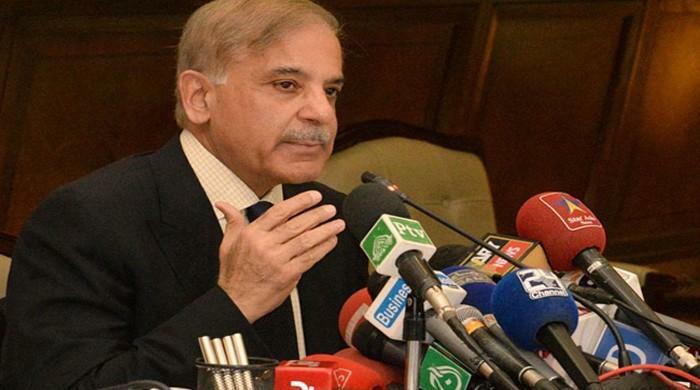 They did not hand it over to interim government either and it had to resort to using a new account (@PunjabGovtpk). The PML-N also renamed the account to make it an archive for their reign in the government. So it was clear that they were in no mood to give ownership of this account to the provincial authorities. But regardless of whatever actually happened here one thing is clear now that they have made up their mind for the transfer. Otherwise there were no reason to strip down the verified account from its official seal, hard earned followers and all of the data. Coming back to the topic, did they really delete the old account and created a new one? Well, this is not the case. There is no way a Twitter account could be deleted like that. In fact, there is no such option. You cannot delete your account all of a sudden. It is a long process that takes at least 30 days. Since the healthy sights of the account was last screen grabbed by almost all news publishers on 24th August, 2018, it is not possible for PML-N to be able to delete the account just yet. So what exactly has happened? If there were a username change then why those 225K+ followers are no longer able to see the changed username in their ‘following’ list? Why old tweets are no longer working? There are many questions that still need an answer but luckily not the ones I have shared above. Let me explain them one by one in the possible course of action PML-N must have had. They must have first created a new Twitter handle. For example, New_ GovtOfPunjab. Then they would have changed the name of official account from GovtOfPunjab to something else like GoodBye_GOP. Then they must have replaced the new account name GoodBye_GOP with the official account name of GovtOfPunjab. So there is a new account with old handle which did not carry old followers or data. This would have left them with the renamed old account GoodBye_GOP with all those followers and data. At that time any follower could have seen this change as all of the RTs would have shown changed name. So next they would have taken the step of deactivation of the GoodBye_GOP account. Deactivation immediately makes your tweets disappear as well as remove your handle from your follower’s accounts but it does not delete your account. Unlike Facebook that keeps your account info even after deactivation, Twitter waits for only 30 days. If you do not reactivate your account within 30 days, all of your followers and data will be lost forever. That new account was created on 25th August and the deletion have been reported only yesterday. So there are good chances that the deactivation of the actual account happened within the last 1-8 days. So in next 3 weeks, if they handover the account, everything can remain intact. Once this time passed, account will get deleted along with any hope of redemption regarding social media ethics and practices. All they need to do is to login to the old account and it will be re-activated. They can then deactivate new account and change old account’s name back before transferring it to the rightful owner. In the meanwhile, the Punjab government can fight the case by approaching Twitter without wasting any more precious time, which reportedly they are doing. So count down has already started. Clock is ticking fast and loud. A table has been setup and stakes look very high with all eyes on this game of “integrity” versus a few hundred thousand twitter “followers”. 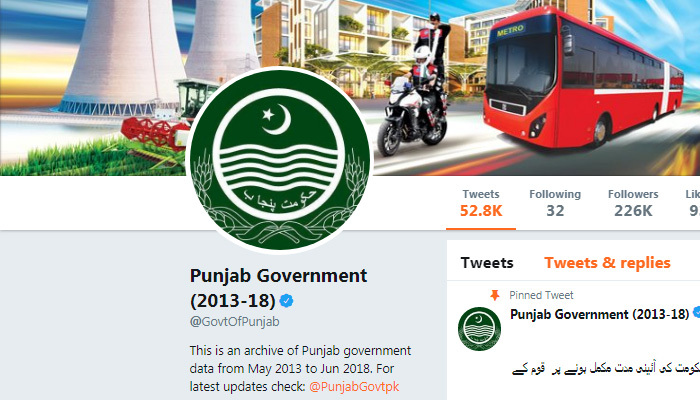 The twitter handle of the Punjab Government, archived by the PML-N as ‘Punjab Government (2013-18)’, has now been deleted and a new one is created which is linked with the official website. LAHORE: The Pakistan Muslim League-Nawaz which ruled the Punjab during the last five years seems reluctant to hand over Official Twitter account to the new government.